I have a confession to make. I was — depending on your perspective — either a very bad knitter or a very good customer this weekend. this is a long entry. just to keep you going, i’ll let you in on a little secret — i finally selected what my rhinebeck sweater will be, and i’m announcing a contest at the end of this entry. Something’s been in the air for me lately. I just haven’t been able to get any projects to “stick”. I’m sure it’s part weather (I hate summer and I really enjoy knitting with wool so it’s hard to do that right now) and part post-project ennui (I often have trouble getting into the groove after I finish a bigger project). 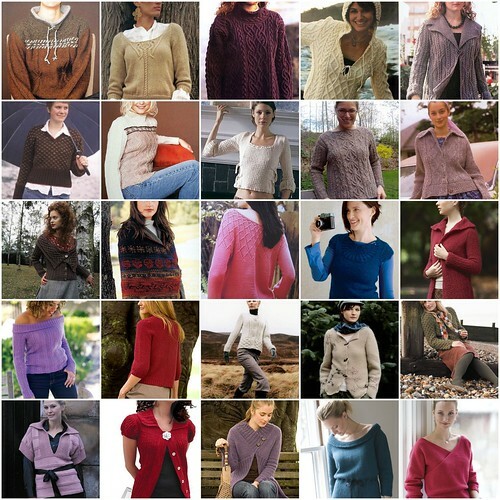 I’ve been doing lots of thinking about my Rhinebeck 07 sweater. I promised myself that I’d knit something fabulous to wear around the fairgrounds that Saturday. Well, instead of the list getting smaller, it’s actually grown in the past few weeks — and really, most of the growing was this weekend. Here’s how my weekend went. After compiling my Fall 07 Knitspiration list I was ready to get started on something new. Since I had to do some work-related clothing shopping anyway, it was easy to convince myself to add in a yarn store or two as well. First stop was Woolbearers. They had gotten in the shades of Jamieson’s that I had special ordered for swatching. While I was there I picked up the new Rowan, the new VK, and RYC Classic Style. Note: how did this pattern book fly under the blog radar? It’s probably my favorite out of the whole RYC line. So, not too much damage at Woolbearers, and most of it was planned anyway. Next stop was Loop, where they were having an 80% off sale on summer yarn. I got a sweater’s worth of GGH Samoa in brown and light blue (I’m thinking hoodie next spring) and 3 balls of laceweight silk for Astrid. OK, not too bad — you can’t pass up a great deal like that. Then I headed up to Tangled Web because they, too, were having a sale. I just don’t have any luck with them. I left there empty handed. So, on my way back home I stopped in at Woolbearers again. 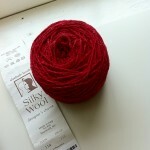 I had this idea for a knitted coat and picked up a few balls of various yarns to swatch. I swatched Saturday night, but nothing was perfect. So then, I noticed Harmony out of my new RYC Classic Style book. It was perfect and I wanted it now. So, Sunday morning I went to Woolbearers again (no luck) and then I went to Rosie’s. After spending 2 hours there I left with the new Jo Sharp Knit 3 book (the one that has this coat in it, with enough Jo Sharp Silkroad DK tweed to do it up. Are you still with me? Unfortunately, I’m not quite done yet. Later on Sunday, I’m sitting on the couch thumbing through my new VK (the 25th anniversary edition) and inspiration strikes. I have THE perfect Rhinebeck sweater. The one that I have to make. And then I realize, I don’t have any yarn for it. So, I buy enough Cascade 220 in the aporto colorway to make my perfect rhinebeck sweater. So there you have it. I’m ashamed to say that all in all I probably bought close to 60 balls of yarn this weekend — my completely ADD unfocused shopping frenzied weekend that ended in the best possible way. I got my yarn yesterday, swatching it up last night, and dare I say it’s perfect. It’s everything I hoped it would be. Are you curious which sweater I chose? Here’s the whole list. You know which yarn I chose, so there are a couple you should be able to knock out pretty quickly. Keep in mind that I like to play with gauge, so don’t dismiss a project just because the gauge doesn’t quite match up. And remember that something in Vogue triggered my idea — could be a yarn, a project, a designer, an ad, anything. But there’s something in this issue of VK that directly correlates with my project choice. It’s a huge issue and I can think of at least 5 possibilities that fit this description without even thumbing through. Make your best guess by 6pm EDT this Sunday (August 12th). If you click on the image above you’ll go to the Flickr version which lists what each project is called. And while this isn’t necessary, I’d love to hear your reasoning behind your guess – gut instinct, project and yarn go well together, or the VK clue. Those of you with the correct answer will be eligible to win something from my stash — something good, I promise. I’m inclined to say sock yarn but if you’re not a sock knitter that won’t be much fun. So, let’s see who wins and we’ll pick out something together that’ll be fabulous for you. I’ll be back on Sunday to show you my progress. Wow! you have a lot on your plate!! I love all your options but, that Cascade will make the perfect TWEEDY ARAN, eh? Hmm – this is really tough! But I’m gonna vote for Celtic Dreams. I think it would look great in Cascade, plus it has the texture you (and me) are craving these days, plus it looks like it would be really flattering on you. It something I like and would make for myself. I’d pick the phildar hoodie to do myself, but since that’s a restart, I’m not choosing it for the contest. (I do hope you get back to it, though!). I’m going to go with the Turbulence U-Neck. It’d be beautiful in that Cascade aporto! I’m going to guess the turbulence u-neck. It’s got enough going on to keep your interest, I think Cascade 220 would work well with the design, it wouldn’t be terribly hot to wear, and it *looks* like you! I’m going to have to go with the Pewter Coat. I figure it’s got to be something with lots of immediate visual impact… I was going to say the phildar hoodie (SO PRETTY!) but like Lauren said, it probably can’t be that one since it’s been hibernating. I have no idea, but my half guess is something with cables lol! LOVE that color of cascade 220 though! Okay, I’m going with the pewter coat, I think. I knocked out the colorwork stuff, and I think the color would be gorgeous for that pattern. I’m going with the pewter coat because VK had a lot of gray, even though you’re not knitting it in gray. Plus, it’s a gut thing. I don’t have that magazine yet, so I’ll just have to guess… Juno! It would look stunning on you. hmm….I think I’ll cast my vote for Juno from Rowan #40. I think it would be stunning on you! I’d have to say the Textured Coat because it is a classic design with lots of attention to detail and Rhinebeck can be warm or cold and a jacket/cardigan gives you the most comfort options: off, on, buttoned, unbuttoned, collar up, collar down. I’m going to go with the phildar hoodie. Mainly because it’s the one I like the best!! and while it looks like i totally copied terhi almost word for word, I promise I didn’t!!! maybe we’re on the right track! I was there Wednesday and I still don’t remember we talked about so many of them. For me: Tilted Duster or bust baby. If I can find the darn magazine. Gah! Gut instinct is the Pewter Coat because of the cables the yarn would work well and because you pointed to the Jo Sharp coat. I thought the Trapeze Cardi might be a possibility, but it doesn’t look like the stitch pattern is too simple if you know what I mean. I’m going to guess the Pewter Coat. I don’t have any particular reason. okay, here’s a crazy vote to mix things up: St. Brigid. Cables to keep your interest (and how!) plus very impressive. And the old guard/new guard articles in VK had Alice Starmore. I vote for textured sweater #15 on the list. I’m going to go with Juno just because I think it would look beautiful! Tilted Duster is my guess. I just love fun fall knitting! There are a few that I want to vote for as Rheinbeck Sweater of the Year, but eeny meeny says Tweedy Aran. It was really fun going through all of your photos and notes! St. Brigid because your friend is hosting the KAL and she can’t wear her St. Brigid to Rhinebeck ’cause she is going to France. Additionally, Alice was wearing her St. Brigid in the interview photo. You know, when I saw Alice Starmore wearing St. Brigid in VK, I was as close as I’ve ever come to casting on another St. Brigid. I’m going to guess that she got to you, too. Final answer. I was there on Wednesday as well and I can’t remember all the sweaters that were discussed but I like Oslo or the RYC Textured Cardigan. Hmm…after looking through VK, I’m ready to make my guess. The issue is heavy on cables and features alot of coat/jacket/cardigan shapes. There was one in particular that struck a chord with me, so I’m thinking maybe you were similarly inspired. That, paired with the color and yarn you chose, makes me think you are making #10, the Tweedy Aran. I’m voting for the Pewter Coat. It’s similar to the other one, but nicer, and a cardigan type is most practical when you’re not sure about the weather. Plus I like it the best. I vote for St. Brigid. I haven’t seen the VK yet (besides the previews on their site) but there’s lots of lovely CABLES (and I think you are fond of cables). I think something in VK keyed you in to get just the right yarn/texture combination you’ve been looking for St. Brigid for years. You’re all about texture, but you bought the Jo Sharp Silky Tweed to do the textured jacket, so that’s not it. And you bought one color, so any of the two-colored patterns are out. 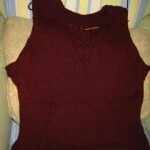 Rhinebeck can be hot, so a sweater that opens is good. My guess is the Textured Cardi from Rowan Classics. 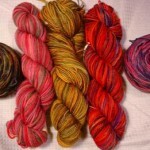 Dose anyone have a list of discount yarn sites. my first response, nearly out loud as i sit here in my PJs, was one of the cardigans. i figured, that would address the unpredictability of temperature in Octobr and you wouldn’t have to sweat if it was warm. but, then i thought about it and realized i wouldn’t want to carry around a cardigan if it was too warm–not on top of all my other purchases. and while we’ve got just a little over 2 months to go, i think St. Brigid might pull it close to the wire, and it also tempts fate that October will have 80 degree days while we’re there. my best guess, given all that reasoning, is turbulence. here’s my thinking: it’s not close at the neck, so there’s room for temperature variation. not 80s, of course, but warmer temps could be tolerated than with, say, St. B. the sleeves look to be 3/4, another temp. consideration. the cables are enough to keep interest without frustrating you as a deadline approaches. i think the aporto would look really nice on this knit, but, MOST of the possibilities you posted would have looked nice in this color. I HOPE THE PRIZE IS A PONY! My guess is Tweedy Aran. It’s been on your list for years and something about the Vogue anniversary issue inspired you. Also the one you admire and link to is a similar color. And Rhinebeck might be warmer, (ya never know what the weather will be here in NY!) so a cardigan is a better choice than a pullover sweater, imo. I am sure whatever it is, it will look wonderful! The yarn is awesome! I’m leaving for vacation in a bit but had to get my guess in, The Tilted Duster. Why? because it charmed me from the first glimpse I got of it in IK. Here’s one more vote for St. Brigid. But those sweaters are all so beautiful– it was hard to make a guess! I’m going with Malt. Er… mainly because it’s the one I’d knit myself. I love the turbulence u-neck and I think it would look lovely on you in that color. Ok, I want to change my guess to the phyllo yoked pullover – is that against the rules? I’ve loved reading your blog for a long time now – I guess I’m a lurker! UGH!! I hate that I am so late to this! I need to keep up better with my blog reading!